The Erasmus Mundus Journalism programme is a master's degree that offers a unique educational experience with students studying and living in at least two European countries. The first year of the degree is spent in Denmark with the entire cohort. The second year sees students split into smaller groups that move to universities in either Swansea, London, Amsterdam or Hamburg to specialise in one of four distinct areas of journalism: War and Conflict, Business and Finance, Media and Politics, or Journalism and Media Across Cultures. 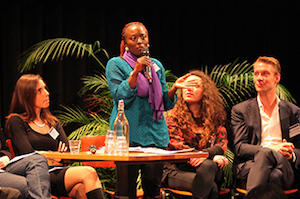 Students in the Mundus Journalism programme gain an outstanding professional network for life, working with peers from all over the world in an interdisciplinary and intercultural environment that is both international and ambitious. You will study at some of Europe’s leading universities where top researchers in media, political studies and journalism are responsible for the teaching. This gives the opportunity to customise your talent to an international level. Students learn to combine academic, theoretical knowledge with journalistic skills, and to analyse, interpret and generate knowledge about the global changes that increasingly challenge traditional boundaries. Graduates of the Mundus Journalism programme go on to achieve success in a diverse range of careers. Many continue with PhD programs, or build successful careers at some of the world's top media organisations - including London's Bloomberg, Beijing's Dow Jones, Nairobi's Radio Africa Group and New York's Al Jazeera offices. Other alumni choose to take their Master's qualification and use it in a related field. Our graduates have landed jobs in public relations and communications for many intergovernmental organisations, at journalism and technology start ups, and at global non-profit companies. The first year is spent in Denmark at Aarhus University and the Danish School of Media and Journalism, and is a progression through knowledge and methodologies related to Globalisation, Political Science, Media Studies and Journalism. Around nine students get the opportunity to study the second semester at either University of California Berkeley, University of Technology Sydney or Pontificia Universidad Católica de Chile. The first year of studies is spent in Aarhus the second biggest city in Denmark. 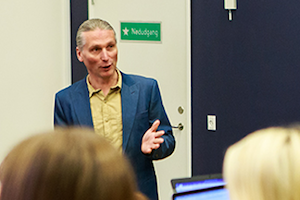 You will study at both Aarhus University and the Danish School of Media and Journalism. The study environment is unique when 80+ students from more than 40 different nationalities meet and share their global outlook. This creates a special set of approaches, questions, methods and intellectual curiosity within the class room. During the 5 first-year modules students gain thorough knowledge about the economic, political, social and cultural contexts of globalisation and journalism, and learn to creatively apply concepts, methods, principles and theories to the study of and practices within global media and journalism. We expect to have around 9 ‘Study Abroad’ places for the 2018-20 programme for students interested in adding an extra experience to their first year of studies. Instead of studying in Aarhus, these students will 'Study Abroad' and spend their second semester (equivalent to 30 ECTS) studying at either University of California at Berkeley, University of Technology Sydney, or at Pontificia Universidad Católica de Chile. For the second year of studies, each student chooses a specialisation - a specific study profile - that suit his/her overall interests, competence profile and future career plans. This specialisation is chosen when applying for admission to the Mundus Journalism programme. If politics is your thing, then the study profile 'Media and Politics' at the University of Amsterdam might be the specialisation for you. The focus here is on (European) politics and its role in globalisation from the perspective of political communication. Political communication looks at the relationship between political actors, media and citizens, which is changing constantly and takes new and different shape in light of a dynamically changing media environment. Also many students from outside the EU choose this profile in order to understand how their national or regional governing bodies i.e African Union or ASEAN, as well as their regional media, interact with or relate to the EU. Many of our graduates with the Media and Politics profile are working at EU departments in Brussels, in communication and media organisations in Europe and beyond, pursue a journalistic career (e.g. for global reporting initiatives), or work at government agencies. If you know you are interested in the changing world of media, you might choose the specialisation 'Journalism and Media across Culture' at the University of Hamburg. Shaped by new research fields and often innovative approaches, this very research oriented study profile focuses on analytical and methodological competencies necessary for understanding and researching transnational and global communication and current developments in journalism. This understanding is central for the core aim of the specialisation: to prepare students to work professionally and independently on a national and international level in the field of communication. Alumni with the Journalism and Media across Culture profile tend to go on to further their academic careers, or work with international NGOs or research organisations, or work on innovative freelance journalism projects. However, some also have gone on to traditional journalism, e.g. with media in their home countries, some even with Deutsche Welle. Financial journalism has changed a lot in the last decade and if you can see yourself shaping the future as a journalist, then the study profile 'Business and Financial Journalism' at City University of London might be the specialisation for you. Students choosing the specialisation 'Business and Financial Journalism' will spend their second year at City, University of London. While some prior knowledge of economics or finance is useful for this course, it is not essential. The main requirements for this specialisation are some prior journalistic experience, and a good first degree. In addition to the Business and Finance modules, students will also have the opportunity to choose from other modules including Introduction to Data Journalism and Journalism Innovation – areas in which the teaching at City closely follows rapidly developing professional practice. Students will combine a rigorous academic understanding and explanation of business and finance with the practical knowledge and experience that comes from being based in one of the key centres of global business and finance and, of course, journalism. This specialisation offers the most practical journalism training, and graduates are newspaper editors, broadcast anchors, magazine editors, and an increasing number work in digital roles as data journalists and online community managers, as financial analysts or media writers for specialist b2b publications. Alumni are currently working for companies and organisations including Wall Street Journal, Bloomberg News, Thomson Reuters, Dow Jones, Associated Press, Handelsblatt and The BBC. If you would like to expand your expertise in terms of reporting on or from developing countries, nations at war or countries undergoing specific hardships, then you choice might be to study the 'War and Conflict' specialisation at Swansea University in your second year of studies. Swansea specialises in the theory and practice of reporting war and conflict within nations and across continents. We seek to understand how such news is constructed, what it offers to its audiences and how it might be improved. Our first semester modules cover risk, contemporary war reporting and the reporting of terrorism and conflict. The modules feature lectures, seminars and workshops designed to develop analytical as well as professional skills for journalists. A 20,000-word dissertation in the second semester offers students the opportunity to design and execute their own research project. This combination of theory and practice, delivered by senior academics and experienced professionals, prepares students for careers in academe as well as the media. Graduates go on to work for national and international media outlets, as media consultants and as freelance journalists, while others pursue a PhD or take up teaching jobs. Students gain an analytical toolkit to understand and analyse war, conflict and development in different global contexts. You can download and read through the general Mundus Journalism Handbook here.